Psychotherapeutic agents are drugs that are used to treat problems in thought processes of individuals with both perceptual and behavioral disorders. These agents do not provide cure for psychoses but they help both adult and pediatric patients perform activities of daily living and function in a more acceptable manner. Other theories explain that certain imbalances of chemicals in specific regions of the brain contribute to mental disorders. Diagnosis of mental disorders is based on Diagnostic and Statistical Manual of Mental Disorders, 5th edition, text revision (DSM-V-TR), which contains description of distinguishing characteristics of each mental disorder. Schizophrenia is most common type of psychosis and can be very disabling. Manifestations include hallucinations, paranoia, delusions, speech abnormalities, and affective problems. It has a very strong genetic association. Mania refers to periods of extreme overactivity and excitement that is associated with bipolar illness. Bipolar disorder is characterized by alternating extremes of depression and hyperactivity and excitement. This reflects neuronal overcompensation and subsequent inability to re-establish stability. Narcolepsy is identified with daytime sleepiness and sudden periods of loss of wakefulness. A problem in the stimulating effect of reticular activating system (RAS) to the brain is one identified error in this disorder. Attention-deficit disorders include various conditions that usually affect school-aged children more than do adults. They are characterized by inability to concentrate on one activity longer than few minutes and a state of hyperkinesis. Antipsychotic drugs are dopamine-receptor blockers used to treat disorders associated with problems in thought processes. These drugs are also referred to as neuroleptic agents because of their known neurological adverse effects. Previously, they were called as major tranquilizers but later this was changed because their primary action is not sedation. Two classifications of antipsychotic drugs are: 1) typical antipsychotics; and 2) atypical antipsychotics. The primary action is to cause change in neuron stimulation and response. Block dopamine receptors, preventing dopamine from stimulating the postsynaptic neurons. They also have anticholinergic, antihistaminic, and alpha-adrenergic blocking effects, all of which are related to its dopamine-receptor blocking action. Other than that, they depress the RAS to limit the stimulation entering the brain. Block both dopamine and serotonin receptors. This dual blocking action help relieve neurological adverse effects associated to typical antipsychotics. 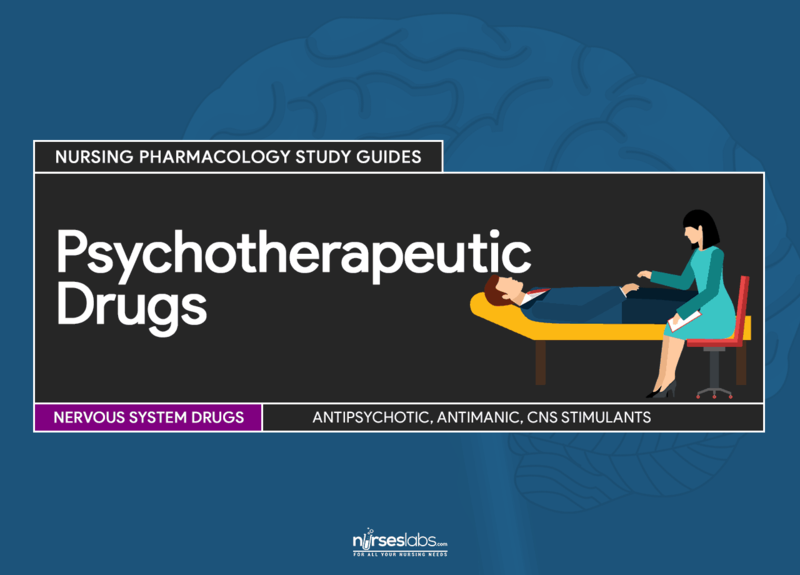 Typical antipsychotics are indicated for schizophrenia and manifestations of other psychotic disorders including hyperactivity, combative behavior, and severe behavioral problems. Some antipsychotics are approved for treatment of bipolar disorder. Atypical antipsychotics are used for treatment of severely ill patients with schizophrenia but are unresponsive to standard drugs. It also reduces the risk of recurrent suicidal behaviors in patients with schizophrenia and schizoaffective disorders. Chlorpromazine, an older antipsychotic, is used to decrease perioperative restlessness and apprehension. In addition to this, it is also used to treat intermittent porphyria, tetanus (adjunct treatment), and control nausea, vomiting, and intractable hiccups. Haloperidol is indicated for acute psychiatric situations and is available in intravenous (IV) form for individuals who need prolonged parenteral therapy but have difficulty in swallowing. Prochlorperazine is indicated for severe vomiting and nausea associated with surgery and chemotherapy. Aripiprazole, a newer atypical antipsychotic, is effective in treating schizophrenia, major depressive disorder, and bipolar disorders. It is available in IV form for treatment of acute agitation associated with these disorders. Risperidone is commonly used for treatment of irritability and aggression in children and adolescents with autism. Antipsychotics are commonly used in children and are often combined with CNS stimulants for control of symptoms and behavior. Parents should be informed that long-term effects of antipsychotics in children are not known. Pediatric dose is usually higher than adult dose and children should be monitored closely for drug adverse effects and developmental progress. Usage of drugs in this population requires close monitoring for adverse effects. For example, thioridazine and ziprasidone can cause changes in QT interval. Cautious use of these drugs for pregnant and lactating women is implemented because of potential adverse effects to fetus or neonate. Stopping this drug may cause symptoms to reoccur so counselling is also needed. Reduced doses of drugs for older adults are required because this population is more susceptible to drug adverse effects. It is important to note that these drugs are not used to control behavior with dementia. QT prolongation caused by previously mentioned antipsychotics is a concern for elderly who have coronary diseases. Presence of diseases that can be exacerbated by dopamine-blocking effects. CNS depression, circulatory collapse, Parkinsons’ disease, coronary disease, severe hypotension, bone marrow suppression, blood dyscrasias. Exacerbated by drug effects. QTc interval prolongation. Contraindicated to mesoridazine, thioridazine, and ziprasidone; can lead to serious cardiac arrhythmias. Dementia. Use is associated with increased risk of CV events and death. Glaucoma, peptic ulcer, urinary or intestinal obstruction. Exacerbated by anticholinergic effects of antipsychotics. Seizure disorders. Possible severe neurosensitivity can lower seizure threshold in patients with thyrotoxicosis. Active alcoholism. Antipsychotics can potentiate CNS depression. Immunosuppression, cancer. Caution is applied because antipsychotics can result to bone marrow suppression and blood dyscrasias. Pregnancy, lactation. Potential adverse effects on the fetus or neonate. Caution is used in children younger than 12 years of age who have chicken pox or a CNS infection because children are more likely to develop dystonia and this could cause confusion in the diagnosis of Reye’s syndrome. CV: hypotension, orthostatic hypotension, cardiac arrhythmias, CHF, pulmonary edema. Phenothiazines can turn urine color into pink to reddish-brown. It has no clinical significance. Assess for the mentioned cautions and contraindications (e.g. drug allergies, CNS depression, CV disorders, glaucoma, respiratory depression, etc.) to prevent any untoward complications. Perform a thorough physical assessment (other medications taken, CNS, skin, respirations, and laboratory tests like thyroid, liver, and renal functions tests and complete blood count or CBC) to establish baseline data before drug therapy begins, to determine effectiveness of therapy, and to evaluate for occurrence of any adverse effects associated with drug therapy. Do not allow patient to crush or chew sustained-release capsules as this will speed up absorption and may cause toxicity. Keep patient in recumbent position for 30 minutes if administering parenteral forms to reduce risk of orthostatic hypotension. Monitor CBC results to arrange to discontinue the drug at signs of bone marrow suppression. Monitor blood glucose levels with long-term use to detect development of glucose intolerance. Monitor patient response to therapy (decrease in signs and symptoms of psychotic disorder). Monitor for adverse effects (e.g. sedation, extrapyramidal effects, hypotension, bone marrow suppression, etc). Antimanic drugs are used to control mania that occurs in individuals with bipolar disorder. Its cause is poorly-understood but is thought to be due to neuronal overstimulation. Lithium is the drug-of-choice or the mainstay treatment for mania. The primary action is to alter transport of sodium in nerve and muscle cells. They also inhibit the release of norepinephrine and dopamine, but not serotonin from stimulated neurons. Other than these, it decreases the intraneuronal content of second messengers. This action allows selective modulation of hyperactive neurons’ responsiveness that contributes to manic state. Treatment of manic episodes of bipolar and manic-depressive illness. Lithium does not have a recommended pediatric dose and is not ordinarily used in children. If used, close monitoring for renal, CNS, CV, and endocrine function is required. Lithium usage of drugs in this population need to be backed up with hydration and salt intake. It requires close monitoring for adverse effects. Cautious use of these drugs for pregnant and lactating women is implemented because of potential adverse effects to fetus or neonate. Stopping this drug may cause symptoms to reoccur so counselling is also needed. Reduced doses of drugs for older adults are required especially for lithium because this population is more susceptible to drug adverse effects. Allergy to lithium. Prevent hypersensitivity reactions. Significant renal and cardiac diseases. Exacerbated by the toxic effects of the drug. History of leukemia, metabolic disorders, dehydration, diuretic use. Lithium depletes sodium reabsorption which can lead to severe hyponatremia. Protracted diarrhea, excessive sweating. Can alter sodium levels. Women of childbearing age are advised to use birth control while taking this drug. Beginning of gastric toxicity with nausea, vomiting, and diarrhea. Assess for the mentioned cautions and contraindications (e.g. drug allergies, renal or CV diseases, suicidal or impulsive patients with severe depression, dehydration and sodium depletion, etc.) to prevent any untoward complications. Perform a thorough physical assessment (other medications taken, CNS, skin, respirations, and laboratory tests like serum lithium levels, thyroid, liver, and renal functions tests and complete blood count or CBC) to establish baseline data before drug therapy begins, to determine effectiveness of therapy, and to evaluate for occurrence of any adverse effects associated with drug therapy. Administer drug cautiously and monitor serum lithium levels daily to monitor for toxic levels and to arrange for appropriate drug dose adjustment. Administer drug with food or milk to reduce GI discomfort if present. Arrange to decrease dose after acute manic episodes because lithium tolerance is greatest during acute episodes and decreases when the acute episode is over. Provide comfort measures (e.g. sugarless lozenges and frequent mouth care, etc.) to help patient tolerate drug effects. Monitor patient response to therapy (decreased manifestations and frequency of manic episodes). Monitor for adverse effects (e.g. CV toxicity, renal toxicity, GI upset, respiratory complications, etc). CNS stimulants are clinically used for treatment of attention-deficit disorders and narcolepsy. These drugs can calm hyperkinetic children and help them focus on one activity for a longer period. In addition, they redirect and excite arousal stimuli from the RAS. Majority of CNS stimulants are controlled substances so it is important for patients to be taught how to secure them to prevent inappropriate use and distribution. Acting as both cortical and RAS stimulants possibly by increasing catecholamine release from presynaptic neurons, CNS stimulants are able to increase stimulation of postsynaptic neurons. The paradoxical calming effect of these drugs in hyperkinetic children is thought to be related to the increased stimulation of an immature RAS leading to an ability to be more selective in response to coming stimuli. Caution should be used with extended-release preparations because they differ markedly in timing and effectiveness. CNS stimulants in children are often indicated for management of attention-deficit disorders. Children should be assessed carefully and challenged periodically for the necessity of continuing the drug. Marked anxiety, agitation, tension and severe fatigue, glaucoma. Can be exacerbated by CNS stimulation caused by these drugs. History of seizures. Can be potentiated by CNS stimulation. History of drug dependence including alcoholism. Drugs may result in physical and psychological dependence. Skin rashes are common reactions. Assess for the mentioned cautions and contraindications (e.g. drug allergies, seizure disorder, anxiety, tension, fatigue, etc.) to prevent any untoward complications. Perform a thorough physical assessment (other medications taken, CNS, skin, respirations, and laboratory tests like liver and renal functions tests and complete blood count or CBC) to establish baseline data before drug therapy begins, to determine effectiveness of therapy, and to evaluate for occurrence of any adverse effects associated with drug therapy. Arrange to interrupt the drug periodically in children to determine whether symptoms recur and therapy should be continued. Arrange to dispense the least amount of drug possible to minimize risk of overdose and abuse. Administer drug before 6 PM as ordered to reduce the incidence of insomnia. Monitor weight, CBC, and ECG to ensure early detection of adverse effects and proper interventions. Monitor patient response to therapy (decrease in signs and symptoms of behavioral syndromes, decrease in daytime sleep and narcolepsy). Monitor for adverse effects (e.g. CNS stimulation, CV effects, rash, physical and psychological dependence, etc). Quiz time! Enjoy and evaluate yourself with this 8-item quiz about psychotherapeutic agents. Student nurse Anne is currently on her psychiatric ward rotation and her clinical instructor engaged her to an oral quiz on psychotherapeutic agents. She would be right to answer that loxapine, thiothixene, and fluphenazine belong to which psychotherapeutic agent classification? Loxapine (Loxitane), thiothixene (Navane), and fluphenazine (Prolixin) are some of the most common examples of typical antipsychotics. Typical antipsychotics block dopamine receptors, preventing dopamine from stimulating the postsynaptic neurons. They are also associated to neurological adverse effects, which are relieved by atypical antipsychotics. These agents are not indicated for behavioral disorders. Psychotherapeutic agents perform their curative functions in patients with psychoses. Antipsychotics address mental disorders mainly through their sedating effects. Psychotherapeutic agents help patients perform activities of daily living with ease. They are indicated for both perceptual and behavioral disorders. They were once called major tranquilizers but later on it was changed because sedation is not their primary or main function. Lastly, they don’t cure psychoses. Antipsychotic which has a role in managing side effects of chemotherapy. It is indicated for severe vomiting and nausea associated with surgery and chemotherapy. What is the top nursing consideration of a nurse who is taking care of an adult client with schizophrenia receiving antipsychotics? Obtain ECG tracing regularly as ordered. Usage of drugs in this population requires close monitoring for adverse effects. For example, thioridazine and ziprasidone can cause changes in QT interval. Caution is used in children younger than 12 years of age who have chickenpox or a CNS infection because children are more likely to develop dystonia and this could cause confusion in the diagnosis of Reye’s syndrome. Use of these agents in patients with dementia increases risk of CV events and death. Lastly, antipsychotics or neuroleptics can potentiate CNS depression in patients with active alcoholism. This drug is the mainstay treatment for mania. All options are antimanic drugs but lithium is the drug of choice for mania. Which of the following is the most important patient education for a patient receiving CNS stimulants? 1. Student nurse Anne is currently on her psychiatric ward rotation and her clinical instructor engaged her to an oral quiz on psychotherapeutic agents. She would be right to answer that loxapine, thiothixene, and fluphenazine belong to which psychotherapeutic agent classification? A. These agents are not indicated for behavioral disorders. B. Psychotherapeutic agents perform their curative functions in patients with psychoses. C. Antipsychotics address mental disorders mainly through their sedating effects. D. Psychotherapeutic agents help patients perform activities of daily living with ease. 3. Antipsychotic which has a role in managing side effects of chemotherapy. 4. What is the top nursing consideration of a nurse who is taking care of an adult client with schizophrenia receiving antipsychotics? B. Obtain ECG tracing regularly as ordered. 6. This drug is the mainstay treatment for mania. 8. Which of the following is the most important patient education for a patient receiving CNS stimulants? 1. Answer: A. Typical antipsychotics. 2. Answer: D. Psychotherapeutic agents help patients perform activities of daily living with ease. 4. Answer: B. Obtain ECG tracing regularly as ordered. 5. Answer: A. Children below age 12. 6. Answer: C. lithium salts (Lithotabs). 8. Answer: A. Proper storage of drugs.